The new trailer for Disney's Wreck-It Ralph was certainly another fun tease for the film coming this November, and plenty of film and video game fans alike are eager to see how this one shakes out. Until then, we'll just have to enjoy the hype machine showing off the characters voiced by John C. Reilly, Jane Lynch, Sarah Silverman and Jack McBrayer. This time it's only Reilly's title character that gets the spotlight, but he's joined by his fellow bad guys that will be familiar to arcade and SEGA fans as M. Bison from Street Fighter, Sonic the Hedgehog, Q*bert and more appear on the colorful poster as well. Look! The bad-guy character Ralph, in the classic game Fix-It Felix Jr., who longs to be a hero brings trouble to his entire arcade after sneaking into a new first-person shooter game and unleashing a deadly enemy. 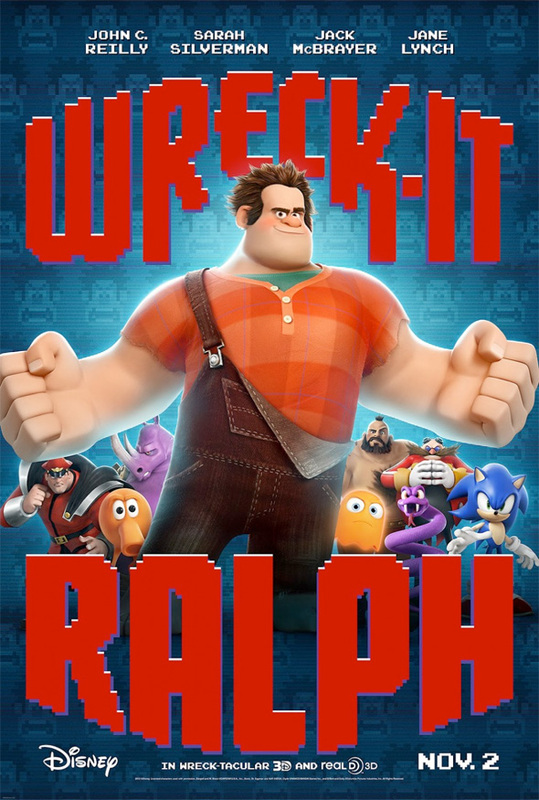 Rich Moore (who has helmed episodes of "Futurama" and "The Simpsons") is directing Wreck-It Ralph, the story of an 8-bit video game character struggling with his own villainous identity with the world of arcade games. John C. Reilly voices the titular character who tries to be a hero, but ends up unleashing a deadly enemy who just might destroy every game in the arcade. Jack McBrayer, Jane Lynch and Sarah Silverman all lend their voices to the film which is slated to hit theaters on November 2nd in 3D. Looking good? Well, lets see you wrecking it, Ralph. I am so ready for this movie to be out already. btw the zombie is hilarious.